Owning and maintaining residential indoor pools as well as outdoor residential pools is not easy. There are maintenance and costs and cleaning services required. Why not call a swimming pool service company in Seminole for all your clean swimming needs? 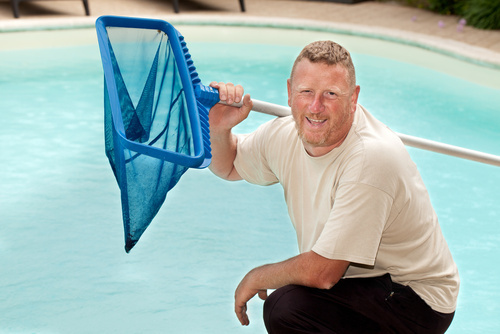 In business since 1959, Triangle Pool Service is dedicated to the full service and satisfaction of their customers. Our pool service and maintenance professionals take their job seriously to ensure you enjoy your private oasis. To maintain the pristine and enjoyable appearance of residential indoor pools, they must also be kept safe and sanitary. Your pool should be a place of peaceful relaxation, not a moldy germ-filled hole in the ground. From cleaning to testing, Triangle provides a complete service package to your keep inground pools average cost down as a top swimming pool maintenance service near you. From residential indoor pools to commercial requirements, we offer scheduled cleaning visits from our pool service and maintenance professionals, starting at three times a week. You don’t have to wade through leafy garbage or particulate matter from Seminole tree debris being blown into your water, let a swimming pool service company do it for you. As a top-notch swimming pool maintenance service near you, we offer vacuum and skimming as well as filter cleaning. Residential pools can be a big undertaking, even after the initial install. An inground pools average cost includes keeping it functional, which can be high without proper maintenance. Chemical additives are an easy way to keep your watering hole sanitary, for the enjoyment of your family and friends. Clogged pipes could be the cause of murky water. An issue like this can increase your inground pools average cost if the water needs to drain or pipes require replacement. In addition to all our cleaning services, our pool service and maintenance professionals repair filters and clogged pumps. There are many local ordinances involved with owning commercial or residential indoor pools, and one of them requires that it not be a local safety or health hazard. We, at the best swimming pool service company in Seminole, can make sure you’re always in compliance with the local laws. It is important that any swimming pool maintenance service near you understands the protocols and regulations involved in residential pools. If you own one on commercial property, the ordinances are even stricter. Our swimming pool service company in Seminole guarantees to keep your watering hole a safe and healthy environment. Creating a serene playful location for community swimmers is a vital part of our pledge to you. Our pool service and maintenance professionals only use the best products and most up-to-date techniques to keep your bathers safe and coming back for more. Lack of proper care and maintenance can also open your business to liability suits. An inground pools average cost does not compare to the cost of a potential lawsuit from an unsafe swimming space. Commercial areas experience a much higher level of swimming traffic, and so those surfaces require special attention. Hire a swimming pool maintenance service near you to reduce risk. Our commercial management system allows us to monitor your water’s condition adamantly and adjust the system for premium pool quality. An inground pools average cost depends on many factors. For example, residential indoor pools differ from outdoor residential pools as well as commercial swim spaces. While this installation can be costly, consider maintenance when calculating your inground pools average cost. With proper cleaning and care, not a lot of money is required post-installation. However, neglect can result in broken pumps, cracked foundations, and many other problems. Hiring a swimming pool maintenance service near you cuts down the cost of repairs. These pool service and maintenance professionals monitor your system to ensure everything is running correctly. Many people do not have time to give their residential indoor pools the care they need to function at their best. Take the hassle off your back with pool service and maintenance professionals from a swimming pool maintenance service near you. Assistance from knowledgeable workers can reduce your inground pools average cost, keeping repairs for outdoor residential pools as well as residential indoor pools to a minimum. For top-notch work at an affordable rate, choose Triangle as your swimming pool service company. We are the highest quality swimming pool service company in Seminole, and we understand that your pool is a major investment and should be taken care of properly. You are a busy person, and we will cater to your schedule. You don’t have time to always be cleaning debris from the water, so let us do it for you. There’s no need to ever come home to a dirty, grungy liquid again. Our pool service and maintenance professionals can clean while homeowners away, so when they come home after a long day and want a relaxing soak, their residential pools are ready for use. An inground pools average cost is no small amount of money, but with proper care from pool service and maintenance professionals, the price is a worthy investment. Research a swimming pool maintenance service near you before selecting the best for your little paradise. No matter how small or big the water’s surface, keeping it pristine is a tough job. Let us maintain it for you. We work with all shapes and sizes of residential pools and commercial pools, including residential indoor pools. With decades of servicing, you can rely on us as a dedicated swimming pool maintenance service near you to make owning a pool a fun, effortless endeavor. We work hard to make sure our customers are happy because your pool is important to us. Our customers rely on our pool service and maintenance professionals to bring them fast, friendly, and, above all, reliable services. This is a job we have succeeded at since 1959. For a full service swimming pool service company in Seminole, Largo, Clearwater, St Pete, or Palm Harbor, call us at (727) 531-0473, or visit us online.